A round-up of artists that transform ordinary holiday decorations into public art installations. During the holiday season, public decorations range from a few twinkling lights in your living room to elaborate department store window displays. It’s arguably the most popular time for art installations, as demonstrated by those neighbors you have that take it just a little bit too far. This makes it the perfect opportunity for artists to take something as simple as an ordinary Christmas tree and turn it into a sculptural installation. Cities, hotels and art galleries alike are commissioning artists to create something unexpected to wow passerbys. Some are exhibited year after year, while others are met with questionable reviews. Whether it’s interactive (like 1024 Architecture’s climbable sound and light structure in Brussels) or socially responsible (like Hello Wood’s community-building donations), each artist on our list found a unique way to interpret evergreens. From Damien Hirst to Alex Chinneck, here are seven artists that took the humble Christmas tree and turned it into a creative installation. For his installation “Suspended Forest”, Michael Neff collected discarded Christmas trees from the streets of Brooklyn and hung them upside down in New Jersey’s Knockdown Center until January 2016. Visitors could walk between the trees and watch them gently spin. Unlike previous incarnations of the project (for example, illegally strung up underneath a highway in Williamsburg, Brooklyn), this indoor location trapped the smell of pine and created a calmer effect that challenged the longevity of the Christmas season. Damien Hirst’s public Christmas tree installation in 2015 caused some commotion with its decorations of syringes and pill bottles. The project was commissioned by London’s Connaught Hotel with the intent of celebrating “the sense of hope derived from the power of science and medicine.” Some of the local businesses didn’t agree and felt that the tree’s close proximity to a homeless shelter mocked drug addiction issues. 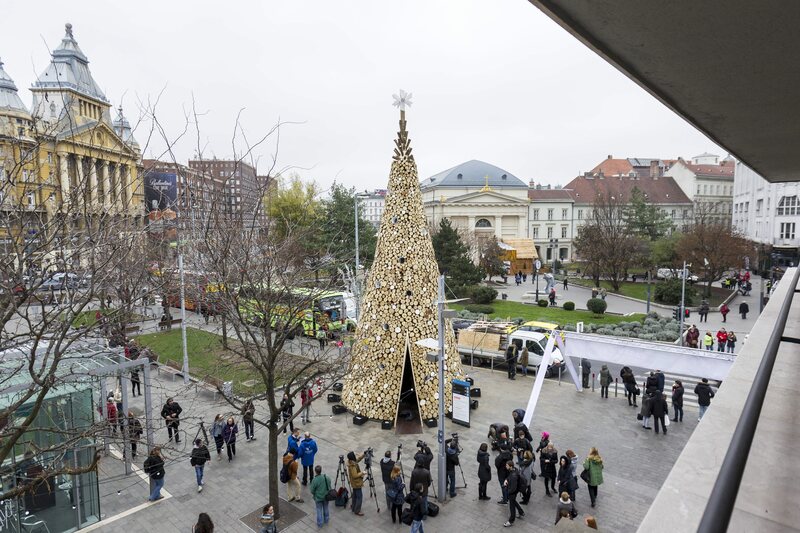 Named “The Charity Tree,” this wood structure was built in Budapest’s Erzsébet Square by socially responsible architecture and design organization Hello Wood. It weighed 40 tons and used 10,000 pieces of firewood, all of which were donated to families in need when the structure was dismantled in January 2016. In a similar fashion, they also built enormous wooden Christmas trees in London and Manchester. The London tree became 100 sleds that were donated to public schools and the Manchester tree materials were recycled to add a workshop space to the nearby Pilcrow Pub. Taking it back to 2012, this Christmas tree installation in Brussels was designed by Pierre Schenider and François Wunschel, who are known collectively as 1024 Architecture. The structure included a light and sound show that filled up the city’s central square. Visitors could also climb up for a panoramic view of the city.